Stephanie~ who wrote, "What a beautiful book! Thanks for introducing us to it! I would love to win!" ﻿Congratulations, Stephanie! Thank you all for the kind comments about Mandy's new book. 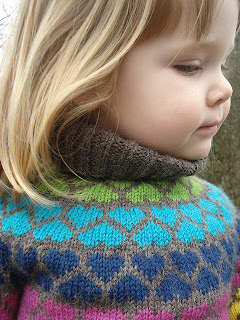 She is giving away a copy of Phoebe's Sweater this week on her blog if you want to check it out! I wanted to share a photo of one of Mandy's other designs, published as a single pattern called "i heart you"- this has been a favorite pattern of ours for some time now. Happy Knitting!